This page summarizes the acts, healing, preaching and miracle making of Jesus in his last 3 years. A map and table summarizes the 100 events in the last 1000 days, and points to the reviewed sites in BibleWalks.com. This page provides a summary of the travels, acts, healing, preaching and miracle making of Jesus. It maps the places where these events occurred to the sites that are reviewed in BibleWalks.com. 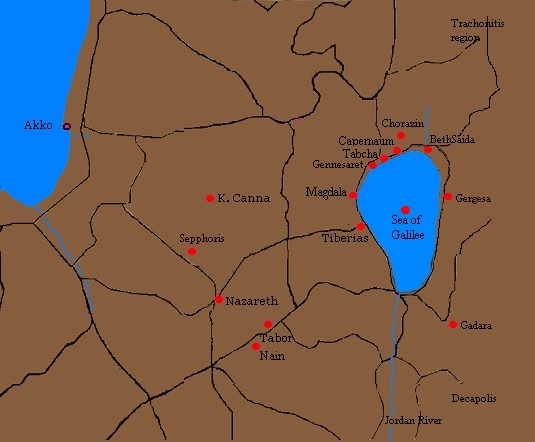 The following map shows the major places in the Galilee where Jesus visited in the 3 years of activities (27AD-30AD). Click on one of the ●Red sites to get more information. The ●Black sites will be featured in the future. You can also see a another set of maps of the Travels of Jesus in the Holy Land. The following table summarizes the 100 events (acts, healing, travel and miracles) of Jesus in his last 1000 days. It provides references in the Four Gospels of the new testament, and points to the sites that are reviewed in BibleWalks.com. Reference (see References below): The list is based on the Harmonies of the Gospels, which are an attempt to organize the Four Gospels into some chronological sequence. The dates are approximated: the years are debated among various scholars (for example: Xenos), and the months are intuitive according to the order and timing of the events. 94 This excitement is noticed by the chief priests Temple mount Lk 19:39; Mt 21:15 Mk 11:11. Story of Jesus: 100 events in 1000 last days, walking thru the biblical sites of the Holy Land. A subtitle describes the event and the site, as in the above table. Each photo is mapped to a web page that adds more information and Biblical references.